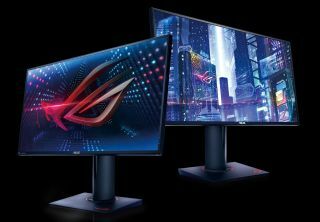 Eye candy Quite likely to be the longest-serving part of your set up, ensuring you pick the best gaming monitor is an absolute must. Buy it now Find the best gaming PC available at the best prices anywhere. News Starting at $2,699, this behemoth 17-inch gaming laptop has a transforming keyboard said to improve airflow. News Big as a TV but built for gaming. Deals A mid-range monitor at an attractive price. News We found it for several hundred dollars less. News A fast gaming monitor. Speed Racer You'll get great performance, but at a steep price. Deals A cheap (but good) monitor. Deals It has an IPS panel and a 144Hz refresh rate. Mixed bag AMD’s Ryzen makes the move to mobile. Deals New ones cost $1,200. News Both displays have a 144Hz refresh rate and 1ms response time. News It's apparently named after an ancient Greek chair, and not to be confused with Thanos. News The detachable design makes it easier to clean. News It's still a pricey monitor, but it has most of the same bells and whistles as the Predator X27 for hundreds of dollars less.